Most of my favorite music over the years has been filled with moments that lead me to say something like, “Here’s the part that always gets me,” whenever I’m listening to it with someone else. For me, the recipe is one of drama combined with immediacy, surprise, and impact. Many of my longtime favorite bands have created such moments with startling consistency through their careers—among others, Sigur Ros, Dirty Three, and Catherine Wheel are on my short list in part because of their facility with this dynamic. Basically the whole subgenre of instrumental post-rock (Mogwai, Godspeed You Black Emperor, Mono, Saxon Shore, etc. ), which I also like as a rule, is based on delivering these hair-raising, tears-in-the-eyes kinds of moments. The chorus of 100 Lovers’ second track, “All the Sand in all the Sea,” ends with the line, “Here’s the part that always gets me,” and as I’ve listened to the new album repeatedly this week, it’s provided a new way to view DeVotchKa and appreciate their grand artistry on an even deeper level. 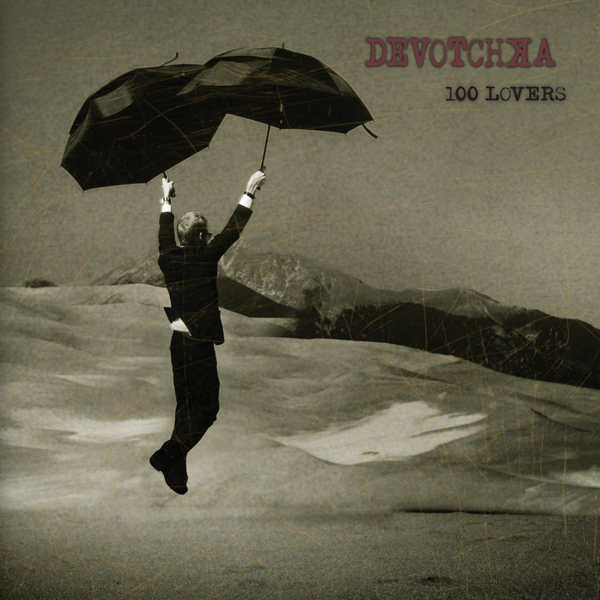 On 100 Lovers, DeVotchKa sustains a striking level of drama for an entire album AND manages to punctuate the affair with many “here’s the part that always gets me” moments. Wonderfully, many of those moments aren’t sonic onslaughts at all, but rather a perfect vocal modulation by singer Nick Urata, or a surprisingly driving but still suitable post-punk guitar riff (in “The Man from San Sebastian”), or an aching violin refrain, or an especially cinematic sweep of brass, strings, and vocals to conclude a song (“Contrabanda”—OK, that one might actually qualify as an “onslaught”). Even if you’re not all that concerned about an album’s ability to deliver “moments,” there’s plenty to recommend about 100 Lovers, even in comparison with earlier entries in DeVotchKa’s much-beloved catalog, which I’ve discussed elsewhere. I’m most impressed by the album’s tightness and compositional economy—there are few if any lost or meandering passages to be found on 100 Lovers, and every melodic, rhythmic, and instrumental part seems to add something vital to the whole. Final verdict: DeVotchKa has achieved a career peak on 100 Lovers. The new album is a near-perfect distillation and presentation of what makes them such a singular, vital presence in American music. Borrowing my own words from last year, DeVotchKa’s sound is “a heady mixture of elegance, soul, musicianship, songcraft, and, dare I say, fun,” and on all those counts, they just keep getting better and better.